Milne Bay public servants celebrate the completion of the PILAG training with CEO Michael Barobe (fourth from left). 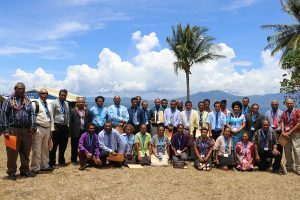 Milne Bay public servants are ready to support local communities and businesses after graduating from the Pacific Institute of Leadership and Governance’s (PILAG) subnational training last week. The intensive program was the first for 2019 and saw 30 public servants come together in Alotau to strengthen core public sector and leadership skills. Michael Barobe, PILAG Chief Executive Officer, said the Institute is committed to subnational training and programs will be delivered at the provincial, district and local levels throughout the year. “We are giving public servants across Papua New Guinea the skills, knowledge and confidence to support their communities,” Mr Barobe said. “No two places are the same – local administrators are best placed to understand the challenges and opportunities faced by people in their districts. The district training rollout is part of PILAG’s commitment to supporting the development of leaders who can drive improved service delivery and economic development. The participants included representatives from Agaun, Alotau, Bolubolu, Bubuleta, Dobu, Esa’ala, Fifebay, Garuahi, Gogosiba, Goilanai, Gurney, Huhu, Losuia, Misima, Murua, Rabaraba, Samarai. Tagula and Weraura. Siobi Eugene believes ethical, capable leaders can make a difference for regional communities. 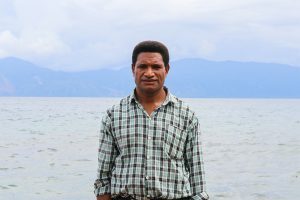 Course participant Siobi Eugene, a business development officer in Alotau District, said the training will result in better projects for local communities. “We have the ability to manage the funds efficiently and effectively, and ensure we are ethical, responsible and transparent in our workplaces. The Pacific Institute of Leadership and Governance – formerly known as the AdCol and PNGIPA – is committed to the development of public service leaders and meeting the training needs of government agencies. More than 400 public servants across eight provinces have now benefited from the PILAG district training rollout, which is supported by the Papua New Guinea – Australia Partnership through the Pacific Leadership and Governance Precinct.